We’ve been inspired by the opening of one of the coolest Los Angeles Rooftop Bars – Spire 73, to offer up our suggestions for a change of perspective where the perfection of LA nights can be celebrated in the most unique way possible: on the roof. The great thing about LA nightlife is not the fact that it continually evolves in the most dynamic and inherently impressive ways (which it does! ), but that there’s something for everyone if you know how to find it. Come for the views, music, food, drink, and people, then stay for a night out that you won’t soon forget. Spire 73 is LA’s newest, and the Western Hemisphere’s tallest, open-air cocktail bar. You’ll find this new outdoor venue on the 73rd floor of the InterContinental Hotel in downtown Los Angeles. Spire 73 is perched 1100 feet above Wilshire Boulevard with its dramatic, steely lines surrounded by glass to shield patrons from wind. Modern, ultra-cool textures embrace seating options including lounging benches, caged cabanas, and mid-century modern themed chairs. Well-placed stone fire pits warm, and divide, seating areas, serving to add a measure of intimacy for patrons. In addition to the impeccable atmosphere, Spire 73 boasts signature cocktails and offers dedicated culinary masterpieces rivaling the extensive drink menu and their selection of whiskey. “Mama Loves LA” and Los Angeles loves Mama Shelter. 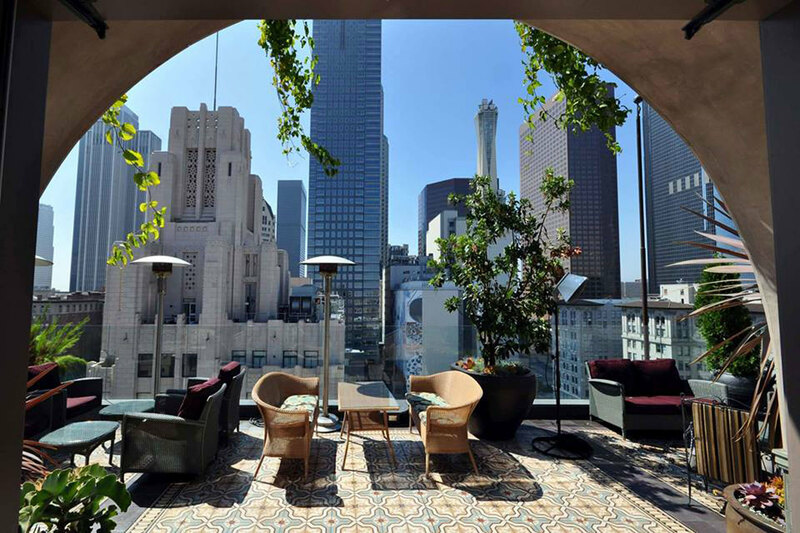 The rooftop bar of the Los Angeles location of the French hotel chain, Mama Shelter, is right in the heart of Hollywood and beckons those seeking a respite from the glitz and pretentious side of LA to the welcoming arms of this laid-back oasis. Mama’s rooftop bar is reminiscent of a Caribbean beach hangout without the beach, colorful, comfy couches with blankets and pillows, tables and chairs, and bar seating amid scattered heat lamps offer opportunities for lounging and enjoying the ambience of this eclectic rooftop bar and lounge. The Upstairs rooftop bar the 1920’s era Ace Hotel is proclaimed as having been inspired by the famous Les Deux Café of Hollywood. This intimate bar scene offers a chill vibe with dim, soft lighting, good music and lots of comfy seating areas. Lounge around the concrete pool, people watch the rich mix of clientele, or bask in the comprehensive views of downtown LA. Events differ every night of the week and include live bands, DJs, pop-up vendors, themed parties, and more. While the plastic drinkware used to serve your beverages may put some off, you will find the establishment’s take on traditional favorites a fun and unique offering. And if oysters are your thing, try the oyster happy hour special or the frozen drink of the day. 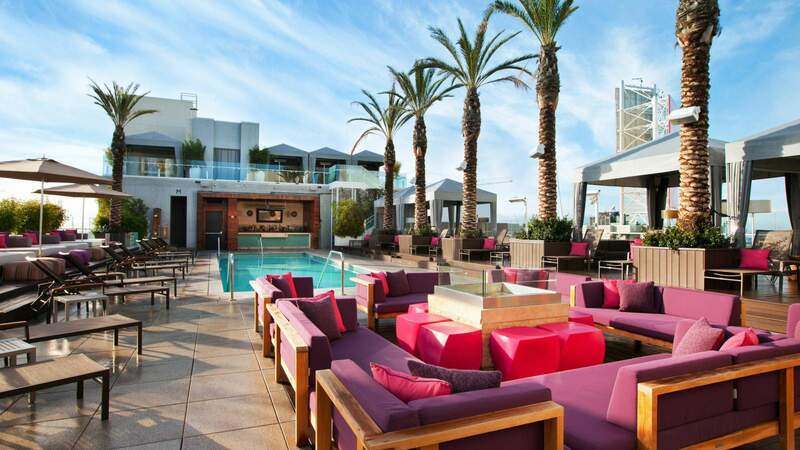 Skybar is the LA hotspot credited with starting it all; a glamorous rooftop bar at the Mondrian Hotel. Multi-level seating areas which include a gorgeous pool with poolside service and, as many say, the most stunning views of Los Angeles, make Skybar a standout. A destination bar to experience the posh nightlife of the quintessential LA bar scene, Skybar is a place to see and be seen in LA; the definition of what is often assumed to be the overall nature of LA. Skybar still utilizes its secretive Sunset Strip entrance and maintains its nightlife cred among locals. With vine covered walls trimming the all-embracing window-like views of this West Hollywood venue, this Latin style bar and lounge provides sinuous nooks and unconfined seating areas which encourage inclusion as much as they do privacy. After dark is when the action really begins at Skybar with world class DJs and pulsating music filling the air while customers enjoy the fresh tastes of the bar menu and house specialty drinks like the Redheaded Moscow Mule. 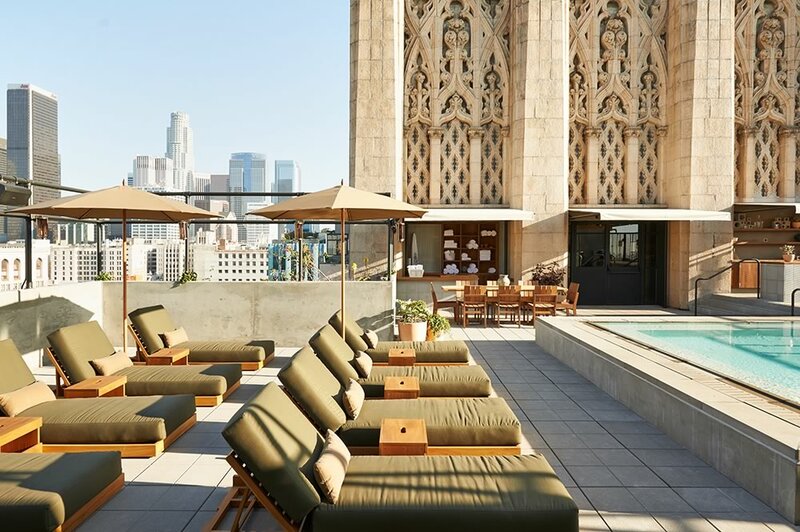 The Rooftop at The Standard in downtown LA offers sweeping, bird’s eye views of downtown LA and the San Gabriel Mountains in the distance. The spacious rooftop bar encompasses two levels which include a classic style German Biergrten in addition to the u-shaped bar, a heated swimming pool, an AstroTurf deck, and a dance floor hosted nightly by popular DJs. An outdoor fireplace accentuates the lounging area comprised of plush couches and standard table and chair seating. On the upper level, you’ll find he Rooftop’s unique waterbed pods, adding to the conspicuously arresting atmosphere; after all, why submit to the ordinary? Food and drink are on par with the amazing atmosphere of this bar and lounge. 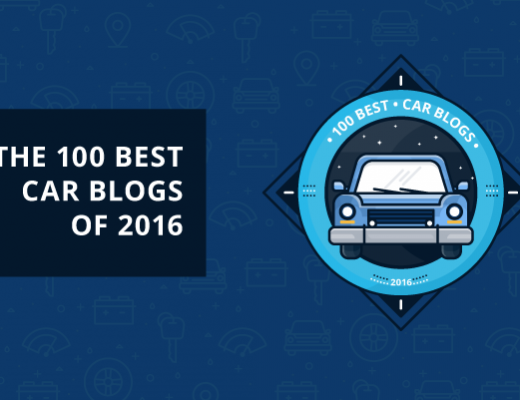 Looking for a refreshing new favorite? Try the watermelon beer. 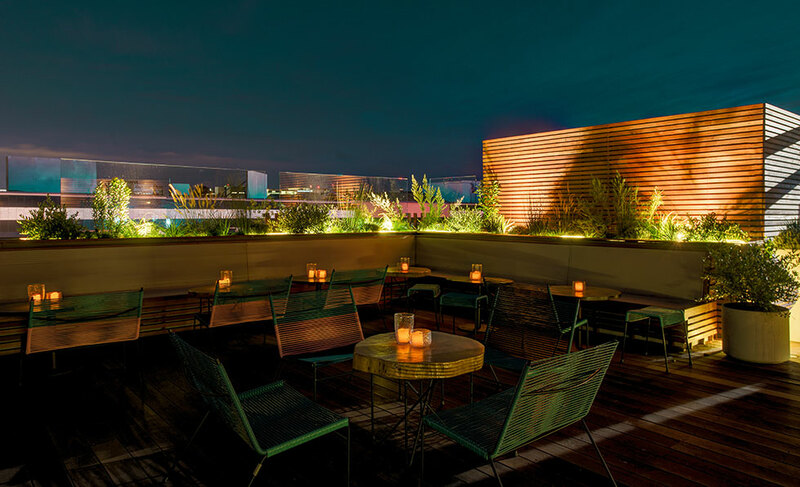 This Los Angeles rooftop bar is a favorite among locals, especially when taking out friends from out of town. This a true LA experience. With striking views of the Sunset Strip and the Hollywood Hills, this casual-chic, trendy LA rooftop bar still manages to emit a laid-back vibe. The elongated rooftop bar of the E.P. & L.P. Asian Eating & Drinking house at Cienega and Melrose is replete with purposeful eclectic contradictions in terms of its décor and atmosphere, food, and clientele. 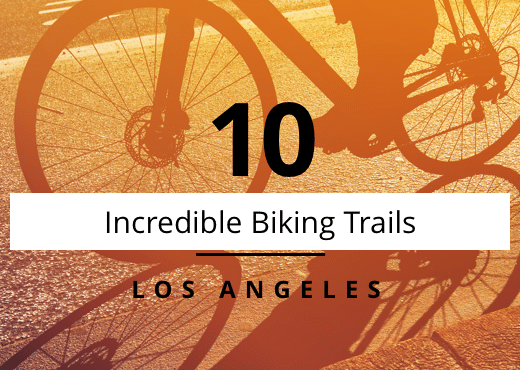 Think neon signs and strewn low-light bulbs, Asian influenced street food and a “secret” bar snack menu, and a place to go and be seen for the young LA crowd. Food options are especially good if yours is an adventurous palate. Try the special churro with the mouth numbing (literally) chocolate Szechuan pepper dessert. The rooftop also contains Frankie’s Bar, dubbed a “secluded nook” in the rear corner of the rooftop footprint with its famous neon sign “Where Love Lives” if you want some privacy. 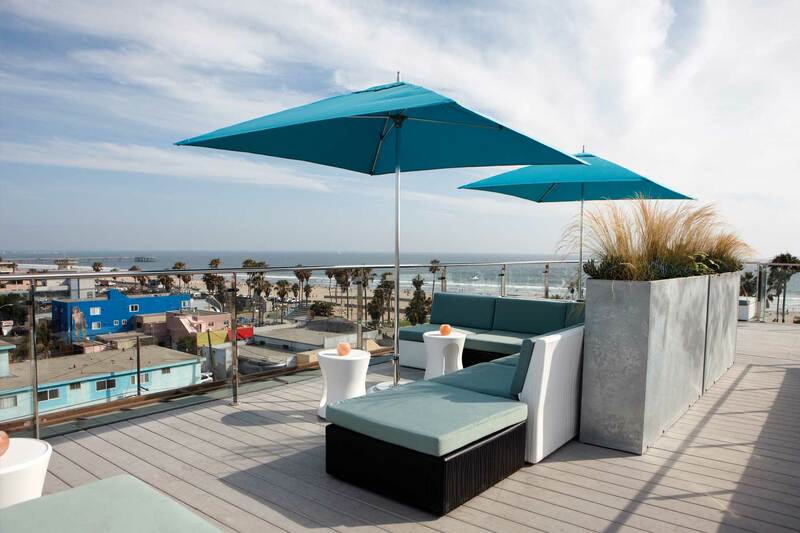 Set above the Hotel Erwin, the High Lounge is the one and only rooftop bar and lounge in Venice Beach. 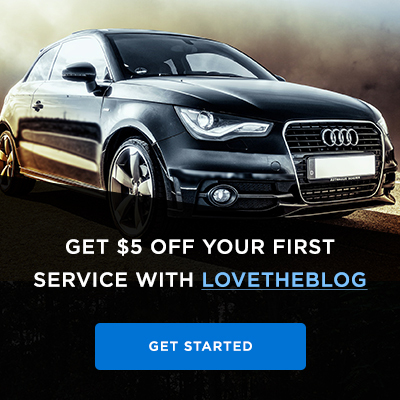 The High Rooftop Lounge offers a casual atmosphere with panoramic views including, according to locals and tourists alike, the best sunset views in LA. This is a hotspot in Venice Beach with a good mix of patrons. Large sofas offer plenty of seating for large parties, and fluffy blankets and heaters are provided if it gets chilly. Nights are full of activity and excitement with live DJs and daily drink specials for your pleasure. The Mezcal cocktail comes highly recommended, and favorite food options include the sliders and fresh guacamole with chips. After a full day in the surf and sun, this is a great place to unwind and let loose with a group of friends. Perch LA is a restaurant and bar encompassing the13th-15th floors of the Pershing building in Downtown Los Angeles. A flight of stairs up from the 15th floor, you will find the Perch Rooftop Lounge. A fitting locale, as the 360 degree view of the downtown cityscape makes you feel as though you are perched dramatically above it all. This rooftop lounge is unique in that it has an upscale ambience but is unassuming, and relaxed. Nightlife is busy most nights with the potential for a wait before entering. Some nights offer live music, otherwise DJs provide the background music for the night’s revelry. The bar has a renowned selection of fine French wines and delicious signature cocktails. Ask for a Midnight in Paris to start the evening on the right foot. Choose gathering around a cozy fire pit to enjoy music, delicious cocktails, and magnificent views, by making Perch your nightlife destination in Los Angeles. 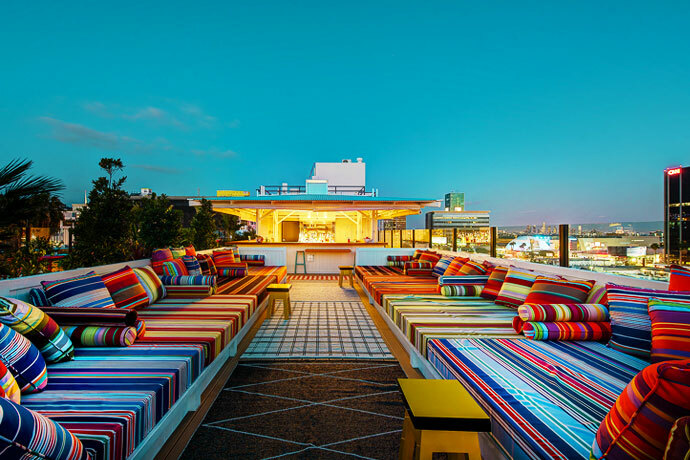 If you’re looking for a late afternoon respite from the hustle of West Hollywood, check out the rooftop pool bar at the W Hotel in Hollywood. This famous pool bar, WET, is not your ordinary pool bar. Primary use is reserved for guests of the hotel, but outside patrons can gain entrance through reserving a daybed or cabana. Some of the hottest DJs in LA spin from 1-5 pm with the exception of the herald Sunday Pool Party where attendees will enjoy the rowdy awesomeness of an all-out exclusive LA pool party from 1-7 pm (tickets must be purchased online). At night, the dress code is “dress to impress” upscale. Men are required to wear collared shirts and closed toe shoes to access the bar. Regular hours for the adult pool bar are 1-8 pm. Atop Hollywood Proper Residences, Filifera is one of LA’s newest rooftop bar and lounge alternatives. 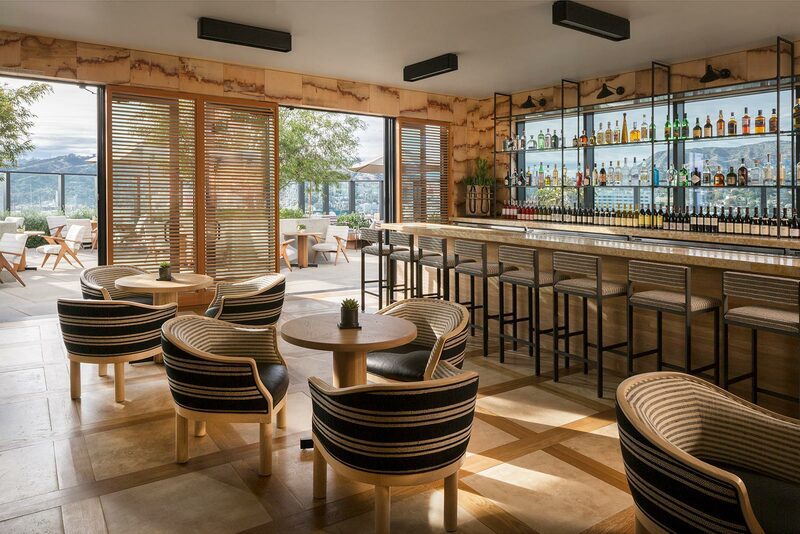 This exquisite space, located on the 22nd floor, provides breathtaking views of the Hollywood Hills and the surrounding area while serving small plate bites and skillfully crafted drinks such as the Mezcal Margarita or the Passion Fruit Fizz. The relaxed, easy going atmosphere invites you to enjoy a consummate night out on an LA rooftop among the stars while socializing in impeccable surroundings and listening to live music or attending any one of their scheduled events, film screenings, or culinary happenings. Locals looking for a new haunt will appreciate the fact that Filifera is in the process of stationing itself as a favored place to go and may want to take this opportunity to be among the first of its regular clientele. So … what are your favorite bars in LA? 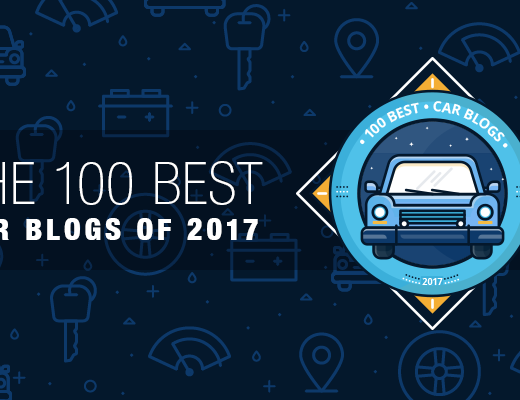 Share your recommendations down below! 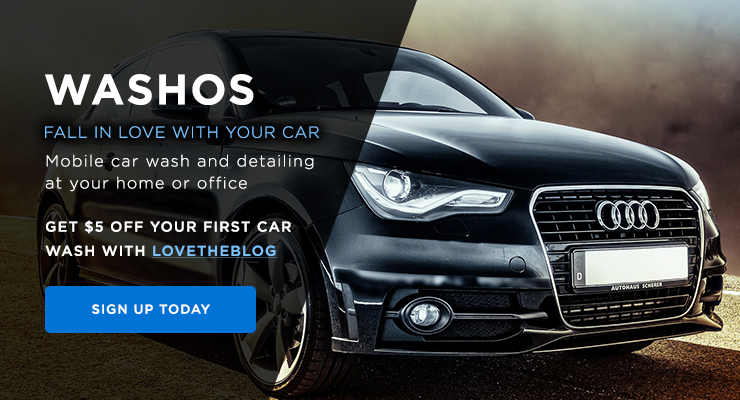 Give your car the TLC it deserves!